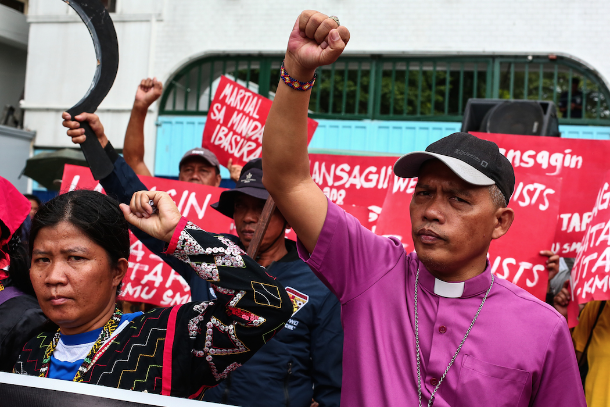 [UCAN] A Protestant bishop led about 500 tribal people, farmers, and human rights activists from the southern Philippines in a protest march to the military headquarters in Manila on Dec. 4. President Rodrigo Duterte declared martial law across Mindanao on May 23 last year after so-called Islamic State gunmen seized the city of Marawi. The resulting five-month conflict resulted in the displacement of around half a million people, about 70,000 of whom remain in temporary shelters. The Philippine Congress has twice extended martial law in the region, which remains in effect until Dec. 31. “The future of [the people of Mindanao] is dark and murderous under Duterte’s martial law,” said the prelate. The bishop claimed that since martial law was implemented more than a year ago, there has been 154 “extrajudicial killings,” 700 individuals have faced “false criminal charges,” and at least 50 tribal schools have been closed by the military. On Dec. 3, the Commission on Human Rights announced that it had found two military officials responsible for human rights abuses in connection with the killing of seven tribal people in December last year. In December last year, tribal leader Datu Victor Danyan and six other people were killed in what human rights groups described as a massacre. The military officials, however, maintained that what happened was a “legitimate encounter” between soldiers and communist rebels that resulted in the deaths of the tribal people and two soldiers. “With yet another extension of martial law looming in Mindanao … we are united in fighting the fascist and dictatorial rule of Duterte,” said the Protestant prelate. On Dec. 4, Philippine Defense Secretary Delfin Lorenzana announced he would support a recommendation from the military to extend martial law in Mindanao for another year. He said a recommendation letter had already been drafted. Lorenzana said there were proposals for “localized martial law” but he said that would not work because Mindanao is a contiguous area.